Elevate Technologies developed the Online Health Portfolio service, which allows users to document their health records, share them with their doctors and family, and upload information through a PC or mobile phone manually or automatically by connecting a medical or wellness device. Our service comes to users through the iHealth application for PCs and mobile, as well as, a web interface. 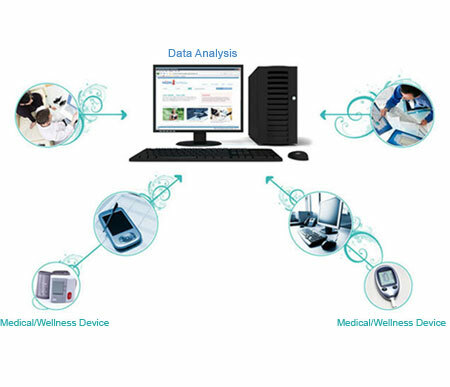 Users can connect medical devices (e.g. glucometers, oximeters, blood pressure monitors) or wellness devices (e.g. pedometers, scales) to their PC or mobile client to automatically upload their measurements, view trends or alerts. Our users own their data and have complete control over who gets to see it. They can decide to authorise doctors, pharmacists, nurses, hospitals, coaches or family members to view their data or receive alerts and notifications for them at critical times. This provides users with complete privacy for their medical and wellness records while being able to share them on a need to know basis. The service is also ideal for medical practitioners, dietitians and coaches who will be able to login at any time and monitor their clients' records in a private, convenient and accessible manner. The Online Health Portfolio system is suited to a wide range of users. People diagnosed with chronic disease such as Diabetes or Cardio-Vascular Disease (CVD) will benefit from having their medications, measurements and other medical record information in one place, which allows multiple medical practitioners to access it and get an accurate and holistic picture of their health. Families will be able to have all their records in one place, which provides them with the mobility and peace of mind that comes from knowing their children's records will be available to any medical practitioner, wherever they go. Athletes and Fitness enthusiasts can record their exercise and nutritional information in one place and share it with their trainers or dietitians to achieve optimal results.